Hi! My name is Lauren and this is my very first costume ever! 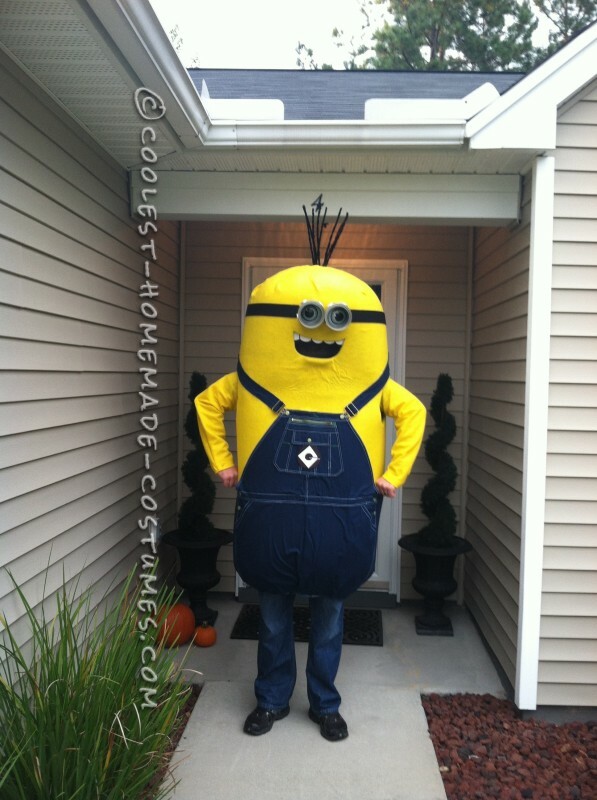 As a child I never went trick-or-treating, so when my husband asked me to make him a minion costume to pass out candy, I jumped at the chance! I consider myself to be a crafty person, but this was a challenge to say the least! I gathered inspiration from different places and spent 3 entire days assembling. The body is made of 3 foam camping mats, the eyes are made of a ball that I cut in half and painted white then drew the eyes on and a gloss coat on top. The goggles are made from empty quart size paint cans cut to size. I purchased yellow felt, overalls, and pipe cleaner for the hair and used hot glue to hold it all together. The teeth and G emblem are made from foam sheets and I used black mesh over the mouth to see out. I made some sleeves from leftover felt and I made shoulder straps inside to keep the mouth at eye level. 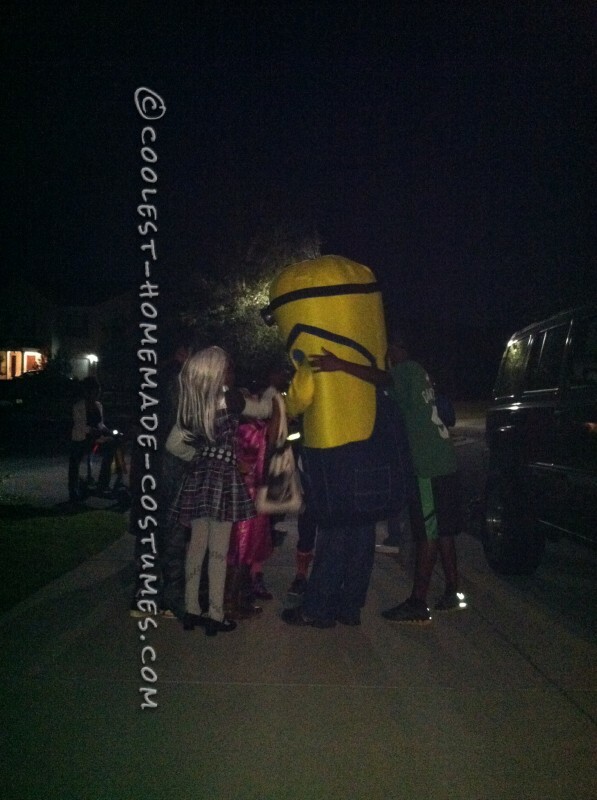 The minion was a huge hit! Kids were hugging him and asking to touch his hair! 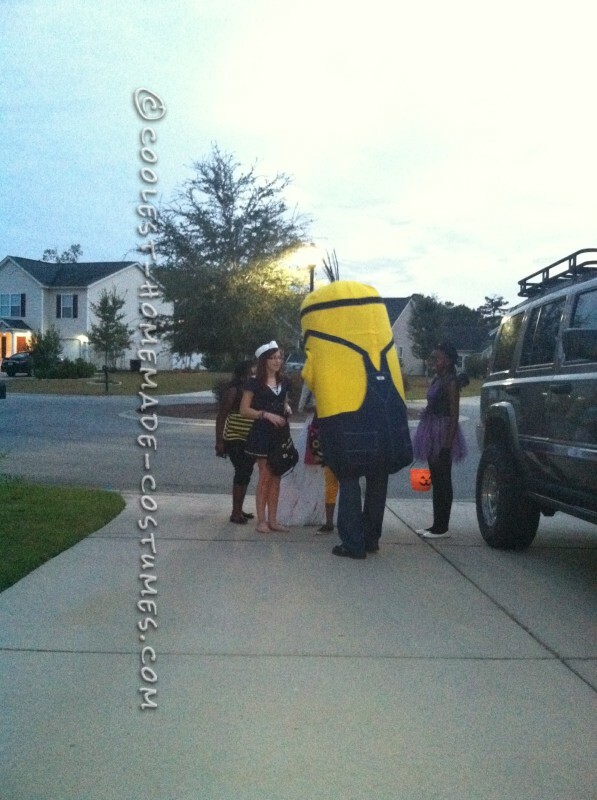 Parents and kids all wanted to get pictures with him and wanted to know where he bought the costume! 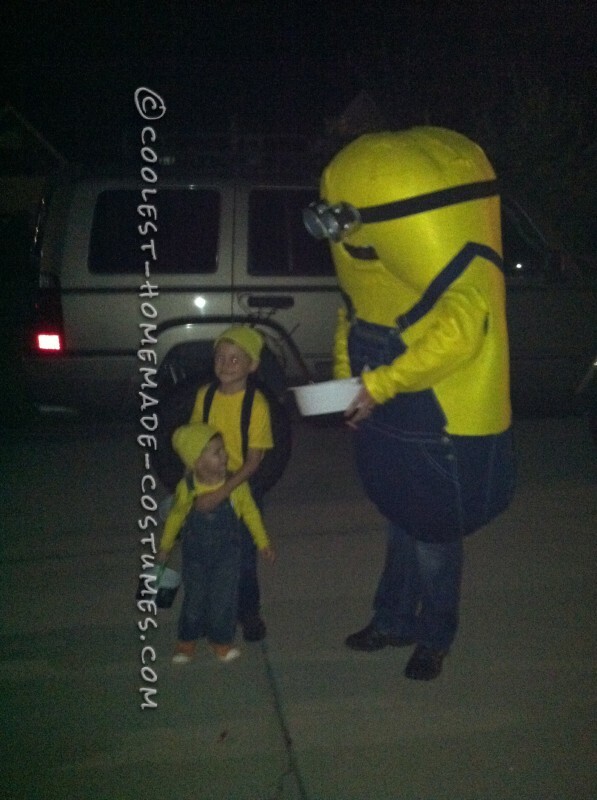 We even had 2 little minions stop by and loved the huge costume! 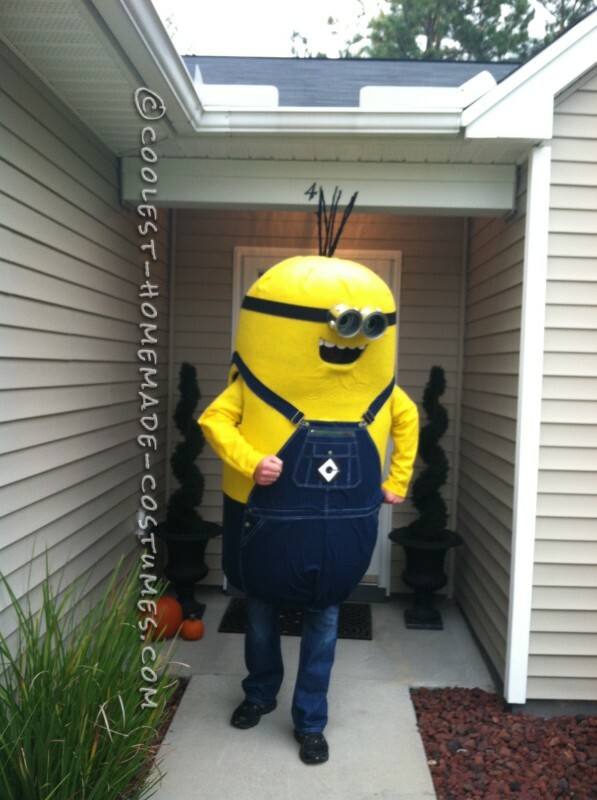 My husband said he will be Gru next year so I can be the minion! It\’s sure to bring lots of fun for years to come! 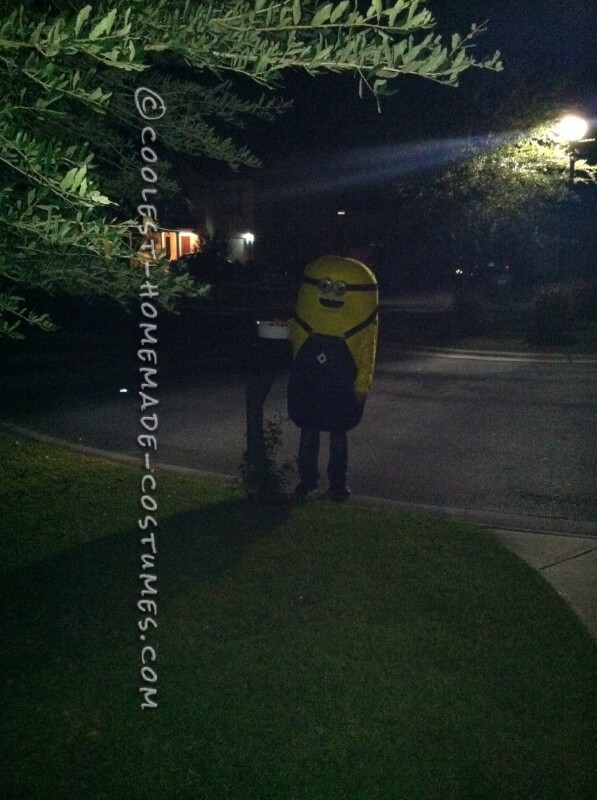 Homemade costume idea posted by Lauren W.